← WIP Wednesday: A Gazillion Things! 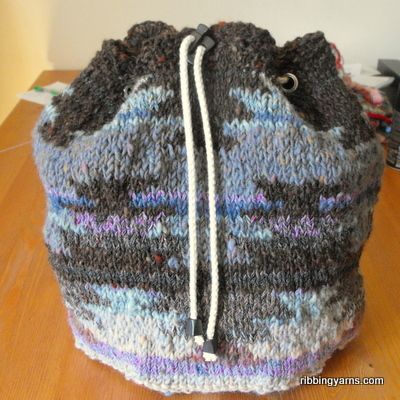 WIP Wednesday: The Amazing Time Travelling Sweater Bag! The next day, a large bag/time capsule arrived which contained the partially finished Landscape Jacket. Needles were still attached here and there, some edges were bound off, there was part of a sleeve too. In the bag was the pattern together with lots and lots of beautiful Rowan tweed yarn in subtle shades and varying thicknesses. What an amazing gift!…but what the hell was I going to do with it? I couldn’t make head or tail of the section that had been knit (backwards, I had been told! ), but the work that had been done was fantastic and just too gorgeous to unravel or chuck away. I thought it would make a really cool bag though, if I could figure out how to make it work. I steeked here, sewed there, picked up and knitted a top section and then did the same for the bottom, knitting a garter stitch base in the round. The fabric is sturdy and carpet like which gives great structure to the duffel, but I’ll also sew in a cotton lining after blocking. At the top I wrestled eyelets into the knit, added a cord and nifty bits I found in Stoff og Stil, and suddenly the bag was taking shape! This entry was posted in Knitting, WIP Wednesday and tagged British wool, Copenhagen, duffel bag, generosity, Kaffe Fassett, knitted bag, Knitting, landscape jacket, reinventing, rowan yarn, Strik, time travel, unfinished knits, upcycled, vintage knits, Woolyknit. Bookmark the permalink.